Every since I put up The Ultimate List of Adsense Ready WordPress Themes, I’ve received some emails asking how to change the Adsense codes in the Themes. It goes without saying, I hope so anyways, that you’ll need an Adsense account. If not, go get one first before trying this. I’m going to try and explain it here, step by step. For this example, I’ll be using the Ads Minded Theme. 1. Choose an Adsense Ready WordPress Theme. You can get one by cliking the link above. 2. Download the theme, choose it in your WordPress control panel under “Presentations”. 3. Once you’ve selected the theme you want and it shows up on your site, go to“Theme Editor” under the “Presentations” button. 4. 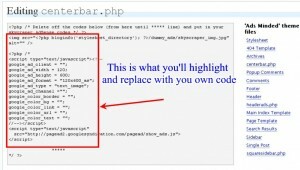 The Adsense Code can be in different files depending on which Theme you choose. The Theme developer will tell you which files contain the Adsense code. You normally find this either on their website or in the readme.txt file. This is what it looks like. 5. Once you find the Google Adsense code in the file, highlight the existing code and replace everything between the <script> and </script> tags with your own code. Now save the file. That’s it. The code in the WordPress Theme should be your own. DO NOT CLICK ON YOUR OWN ADS! It’s against Google Adsense TOS and can get you banned. I know it can happen sometimes when you’re working on a site and you do it without thinking. If that happens, you might want to contact Adsense and let them now what happened. To make sure that the correct ads are showing, I monitor my Adsense ads in my control panel and make sure impressions and clicks are showing up. Let’s say you have www.123abcdef.com with adsense on it. You’ve just used a new blog theme and inserted your adsense code into the theme. Let’s also assume that you’ve been receiving impressions and clicks so you know you have traffic. If you stop receiving impressions and clicks after inserting the code, you may want to redo it. Chances are it’s not counting. Good luck and have fun with these WordPress Themes and Google Adsense!